← Graham Tichy Trio at Carmen’s! 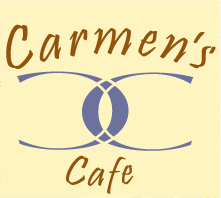 Come to “Greg Guba & Carolyn Brown at Carmen’s Cafe on Fri Apr 08, 2011” Friday, April 8 from 6:00 pm to 9:00 pm. Greg & Carolyn play the Blues/folk & county — acoustic style. Music starts at 6. Full Tapas menu, with wine, beer & sangria. Carolyn Brown is 26 years old and lives in Rotterdam, New York. Her music is a combination of Country/Folk and Singer/Songwriter. Some have compared her voice to that of Jewel who is her musical influence. Carolyn is currently working on her Debut album “Through the Mud” with producer/musician Marcus Larabee at Marcoustic Productions in Verona, New York. The album is a story that takes listeners through heart break, life’s confusions, to finding new love and happiness. Carolyn Brown’s music is down to earth and can relate to anyone’s situation. She also has a music page on myspace at www.myspace.com/babyopal9 Join her fanlist and you will be automatically entered to win a Free Autographed copy of her Debut Album!! This entry was posted in Live Music, Upcoming Events and tagged 518, blues, capital district, Carmen's cafe, carolyn brown, country, Greg guba, Live Music, music. Bookmark the permalink.